Komplett renoviert, Offenes Konzept, Gemütlich, Neu Alles, Michigan Kirschholzböden, Kathedrale Decken, 3 Große Schlafzimmer, Schöne Lake Front Eigentum, Privatstrand, WIFI, Deck, Grill, Kajaks, Schwimmdock, Bootsanlegestelle, Tubes, Yard Games ( Bocci, Taschen), Sportbälle (Fußball, Fußball). Ein wunderbarer Ort, um mit Ihrer Familie unvergessliche Sommerferien zu verbringen. 100 'private Front am schönen Clear Lake in der Nähe von Twin Lake. Das Haus ist 1.500 Quadratmeter - ideal für 2 große Familien oder 3 kleinere Familien. Clear Lake ist ungefähr 100 Acres, kein großer See. Nur die Hälfte des Sees ist bebaut, so dass der Schiffsverkehr sehr gering ist. Der See ist ein reiner Sportsee. Ideal zum Schwimmen, Tubing, Skifahren, Angeln usw. Michigans Abenteuer, Cedar Creek Golf, Cedar Creek Trails alle innerhalb von 5-15 Minuten. This home was perfect. We had 3 adults and 5 boys stay for a week in this home. My teenage boys enjoyed kayaking and building many different creations in the sand. My 4 year old was able to swim in the lake as it was shallow enough for him to enjoy. It did rain during our stay but the house was stocked with games and toys that kept everyone busy. We cooked all our meals at the home and it was well stocked with everything we needed. The owners have thought of everything and I am grateful for the memories we were able to make. This home was very clean, very private, and very well stocked. The owners have done everything right. We had 6 adults and 5 children in our group and hope very much to rent this property again. 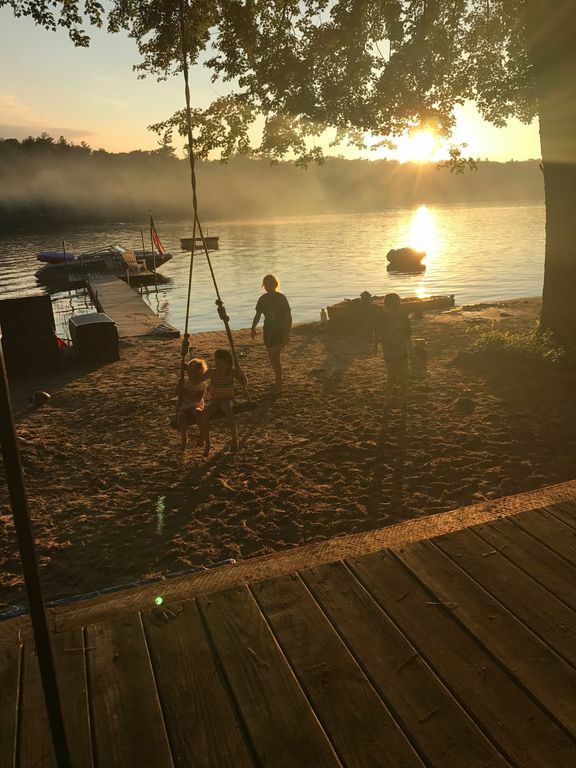 If you like relaxing, swimming, kayaking, fishing, grilling and sitting around the fire pit, then book immediately and feel confident you’re putting your hard earned cash to good use. I should also mention that the weather was 90 degrees & sunny, which we considered perfect. However, if the weather was cold and rainy, I suspect we still would have enjoyed watching movies (great tv), playing board games (great selection), or looking at the beautiful lake from the enclosed back porch. We had a great time with our kids at this home. The property is located perfectly and felt like a home away from home! There are plenty of things to do and you will not want to leave! We hope to stay here again in the near future! Thanks Cory! Clean and cozy. Very chilled backyard. Really enjoy the kayaks and swing on the tree. Owners were super nice. We really strive for perfection, but I accept this 4-star review. We did not have the central air installed yet, of course, we did not advertise central air either. Regardless, it happened to be the hottest Memorial Day Weekend in history. Needless to say, our guests were a little uncomfortable. The very next week, we had the central air installed. Thank you again. It was a pleasure meeting your family. We hope to see you again next summer for a little redemption! !